Hello, friends! I've been MIA again this week! CHA always takes a little recovery time but I'm trying to get back in the groove! It is odd to be so inspired by new products and yet so exhausted that the mojo is elusive! It's color challenge time for the GRS design team. 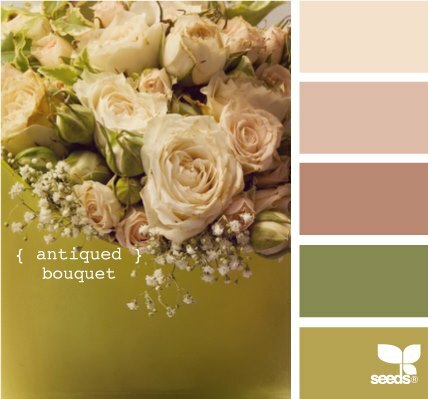 We were given a lovely Design Seeds Antique Bouquet photo for inspiration! I really love these soft, feminine colors, and used my water-based markers to ink up Rustic Floral, one of the new appetizers. 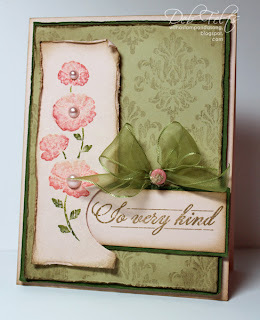 The background was stamped with the damask from the same set with "stamped off" distress ink. For the layout, I used an oval die to follow the curve of the floral stem, allowing the sentiment to peek through from underneath, finishing with a few pearls and a sheer bow. For those of you who might be interested in what's been happening in the Felts household since my last post, I'll back-track a little! The rest of you can head over to the GRS blog to see what beauties my team mates are sharing for their challenge projects! Life is always full of some sort of excitement, however "everyday" that excitement might be! A couple of days after I got home from CHA we had a new fridge delivered...after a "30 minute warning call" I emptied all the chilled and frozen foods from the old one onto counters and sink so the installers could haul it away and set up the new one, but they wouldn't move it without the plumber coming first to fix the water valve to the ice maker, so that ended up being an all day adventure with wall-to-wall refrigerators for most of the afternoon! Thankfully by the end of the day the new one was where it belonged, the counters and sink were visible again, and Patrick and Matthew (with the help of the neighbor's dolly) had managed to get the old one out to the back porch! The guys from Home Depot came back a few days later to haul the old one away and so (as far as kitchen appliances are concerned) life has returned to normal. You might recall that I started a new diet on December 27th. Last Thursday I was really pleased to have lost about 3/4 of a pound in spite of cheating a little bit on my trip to California, and yesterday I was even more pleased to have lost 3 more pounds this week! So far (in about 4 weeks), I'm down 9.2 pounds total. Yay me! I'm taking Advocare supplements and following a clean, high protein/healthy carbs diet. I gave up coffee and wine (except for special occasions), bread, pasta, and even my beloved diet coke! I know it's working, because in addition to losing a few pounds, when I went to donate blood on Tuesday, my iron was the highest it's been in quite a while! I've been reading and researching various diet plans lately...including the Paleo diet and the Eat 4 Your Type diet which (for my O+ blood type), both recommend eating gluten-free. With my family's medical history and my own auto-immune issues, I am really wondering whether I might be gluten-sensitive! Since gluten intolerance is hereditary, there's a simple cheek-swab DNA test to find out for sure. Regardless of the results, I'll be eating less wheat to try to lower my cholesterol, which is what really motivated me to start my dietary changes in the first place. I'm really amazed at all I've learned in the last few weeks, especially about how many illnesses might actually be gluten-related. January 18th marked one year since mom had her mastectomy, and it's time for her to have some follow-up studies...I do my best not to worry until there's a real reason to, but sometimes it is easy to get carried away! I am glad that the doctors are thorough and cautious, but waiting for those results can certainly make one apprehensive! If you're a praying person, we would appreciate your prayers! Have a great weekend! I hope to see you again soon! 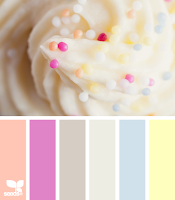 Today is design team challenge day, and this month we've got some yummy Design Seeds color inspiration. I chose to interpret this one literally by coloring GRS' banana split in some delicious Copic flavors for a card made using Mojo Sketch 235! 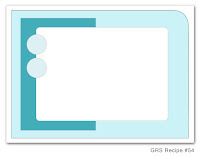 The printed and solid background prints are from Fancy Pants Hopscotch designer paper pack. 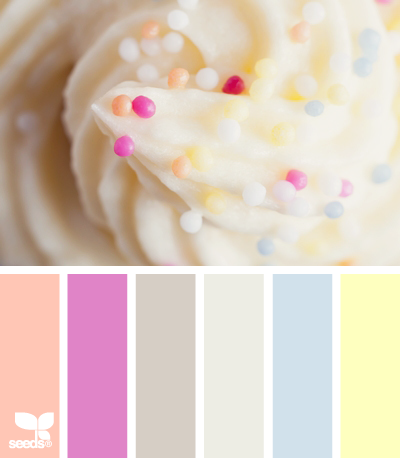 For some reason this print made me think of a flannel-backed table cloth that you might find on a table at a mom-and-pop ice cream parlor, so I thought it worked with this image...can't you just imagine having to wipe up some delicious ice cream stickiness!? I remember going with my family to Borden's! love Love LOVE (hence the hearts)! Anybody with me? Check out what the rest of the ihp team has created! It's sketch time for the girls at Gourmet Rubber Stamps! Here's what we were given to work with. 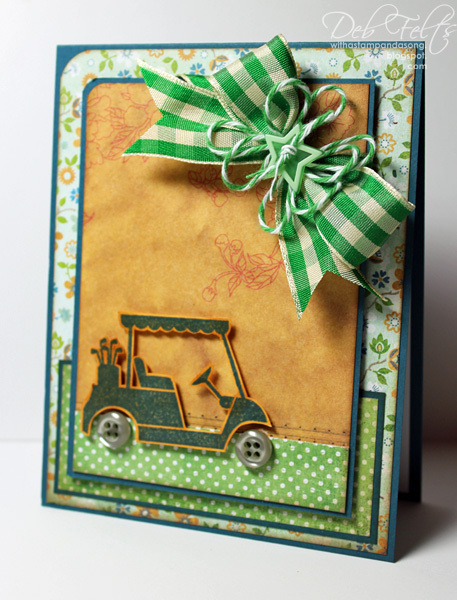 I flipped it 90 degrees and used buttons for the wheels of this cute little golf cart for a "girls on the green" card. 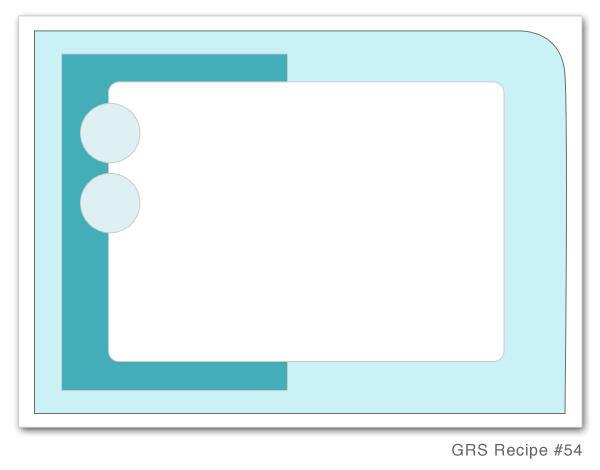 Visit the GRS blog for links to my design team mates' sketch projects! Happy New Year! I hope you had an enjoyable holiday! Our family had a wonderful, peaceful Christmas and New Year's week...Patrick was off work, so I took a break from stamping and just enjoyed doing family-oriented things. Today I'm excited to share with you a brand new product line from Gourmet Rubber Stamps! 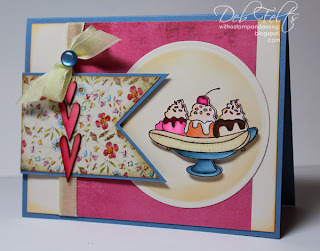 "Truffles" are stamp sets which contain two coordinating stamps...you can use 'em together or separate! So cute! My card for today features one of my favorites of this new release, Music! LOVE this sentiment! 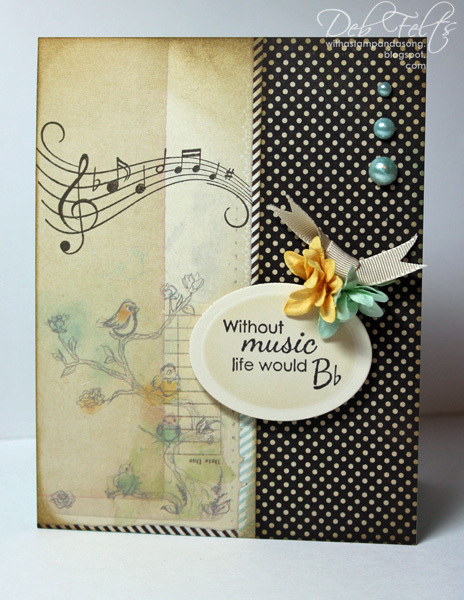 The sweet bird image on this Basic Grey Serenade designer paper coordinates perfectly and made this card a very quick and easy project.